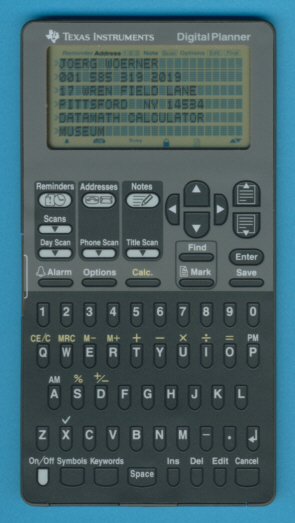 Size: 6.5" x 3.4" x 0.2"
The IS-8400 Digital Planner series of Organizers were introduced already in 1993 and ahead the competition. With the slim housing measuring only 0.2 inch they fitted perfectly in a Time System including a calendar, Today pages and tabs for notes, meetings and finances. • A calendar from January, 1960 to December, 2059. The display of the IS-8400 is very useful supporting 6 lines by 24 characters. The language of the menues could be choosen between five languages: French, English, German, Italian and Spanish. The IS-8200 Digital Planner uses 32k Byte memory instead the 64k Bytes. In the United States a very similar product was sold as PS-9500. Most astonishing with the IS-8400 Digital Planner is the thin housing measuring only 0.2 inch. The technology behind the membrane keyboard is similar to the PS-2100 introduced one year earlier. The electronics of the IS-8400 uses a clever arrangement of standard components found already in the PS-6600 and continued with the PS-6700. © Joerg Woerner, February 10, 2002. No reprints without written permission.